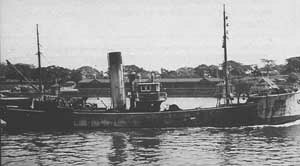 During World War I, 145 "Castle" class auxiliary minesweepers were built for the Royal Navy. 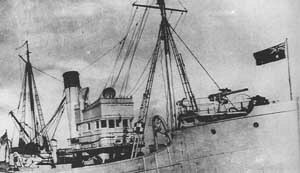 After the war, additional ships were built as trawlers and many of the minesweepers were converted to trawlers (see SS Olive Cam for another example). In January 1917 a "Castle" class auxiliary minesweeper was ordered by the British Admiralty for the Royal Navy. 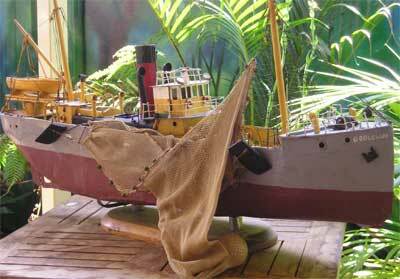 Sometime in 1918 it was launched from the Kingston Shipbuilding Company Limited shipyard at Kingston, Ontario, Canada. The new ship (called TR19 at that time) was 125.7 feet long (136 feet overall), 23.5 feet wide and displaced 271 tons. Although ordered by the Admiralty, it was supervised and paid for by the Royal Canadian Navy. On 25 August 1918 it was completed by the Collingwood Shipbuilding Company Ltd shipyards at Collingwood, Ontario. The new ship was powered by a triple expansion steam engine built by National Shipbuilding Company Ltd, Goderich, Ontario. The steam came from a single coal powered boiler. It was then commissioned into the Royal Canadian Navy. I am not sure what its name was, perhaps TR17. On 7 January 1919 the ship was paid off and laid up. In 1920 an offer put up by Rose Street Foundry and Engineering Company Limited, Inverness, Scotland, (owned by Captain D. J. Munro?) for reconditioning and lay-up prior to its sale was accepted. The vessel was taken to Scotland at The Admiralty's expense. In August 1926 the ship was sold to Boston Deep Sea Fishing and Ice Company Limited, Fleetwood, Lancashire, England. The Manager was Basil A. Parkes. On 16 September 1926 the vessel was renamed SS Almeria (FD117). In 1928 the Almeria was sold to Red Funnel Fisheries Ltd of Sydney, Australia. On 3 September 1928 the ship was renamed SS Goolgwai and she sailed from Fleetwood on 15 September 1928 for Sydney. She was in company with SS Durraween (FD135) which was also destined for Red Funnel Fisheries. The Durraween was also a Castle class ship which was later to become HMAS Durraween in World War II. They arrived in Australia later the same year. In 1933 the name of the company changed to Red Funnel Trawlers Pty Ltd with its headquarters being located at Woolloomooloo Bay in Sydney Harbour but it is probable that it was the same company with a simple name change. 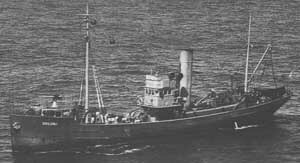 In the years 1937-39 the Goolgwai did 1,589 operations (no idea what an operation is - perhaps trawls) and caught 521,114 kg of fish. On 13 September 1939, only a few days after the start of World War II, the Goolgwai was the first small ship requisitioned by the Royal Australian Navy (RAN) and fitted with one 12 pound gun, one .303 Vickers machine gun and four depth charge launchers. Minesweeping equipment was also installed and on 6 October 1939 she was commissioned into the RAN as HMAS Goolgwai (FY94), an auxiliary minesweeper. Crewed by two officers and 20 men, she operated out of Sydney at first and then moved to the Cape York/Thursday Island area of Queensland. She was also used as a survey vessel. On 29 October 1945, the Goolgwai was paid off from the RAN and on 17 June 1947 she was returned to her owners, Red Funnel Trawlers. It is not clear why it took so long to return her to the owners. Two other Red Funnel trawlers were also requisitioned for war use, HMAS Korowa and as previously mentioned, HMAS Durraween. The SS Goolgwai had a reputation as a ship that handled the seas well. This is a comment from George Haigh who as a 14 year old sailed on her for 3 weeks - his father was Alfred Haigh who during the early to mid-1950s was the ship's skipper. For the period 1951-55 the ship did 1,380 operations and caught 410,235 kg of fish. On about 18 May 1955, the Goolgwai headed out of Sydney Harbour for the Far South Coast of New South Wales for its regular fishing trip. After 11 days, she was approaching Sydney with 400 boxes of fish aboard when thick fog was encountered. Captain Mullarkey ordered soundings to be taken. 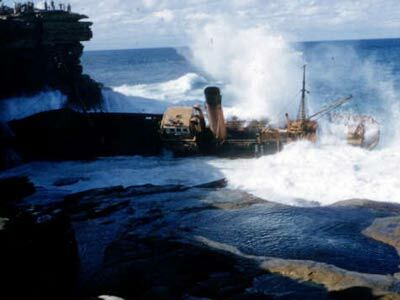 The depth was reported to be37 fathoms (67 metres or 222 feet) then one minute later the Goolgwai was aground on North Point, Malabar, better known as Boora Point (however, see comments later by Dennis Simpson about wreck location as well as my own). This point is the outer eastern point of Long Bay. The claim about the depth and time is unlikely as the depth even two kilometres south of here is only 51 metres (190 feet). The Captain ordered the engines full astern but the prop was fouled on the rocks. Note that there is a prop roughly where the stern of the ship is in the photo at left, see later comments. The following photographs were supplied to me by Peter Cook. He scanned them from slides supplied by an unknown Malabar resident who thought that that they were of the MV Malabar. 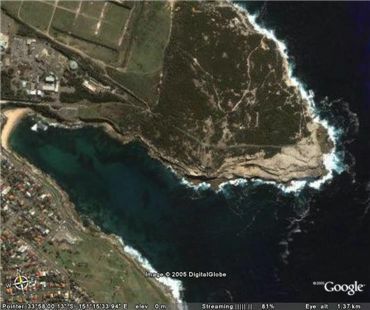 Sydney Button of Botany was fishing on the point at 7 am on Sunday 29 May 1955 when he heard a crashing sound. Looking around, he saw the shape of the Goolgwai on the rock platform. 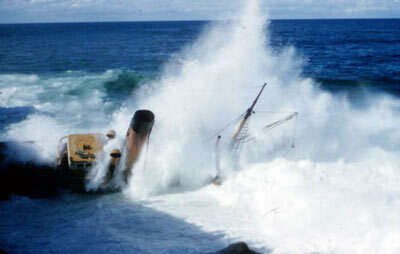 The seas were very large and photos taken later that day show waves breaking right over the wreck. Ten of the 11 crew jumped from the ship onto the rock platform and were assisted up the cliff face by fishers. Two crew were also injured. John Munro, the fireman, broke his kneecap when a wave washed him off his feet and swept him through a scupper into the ocean. 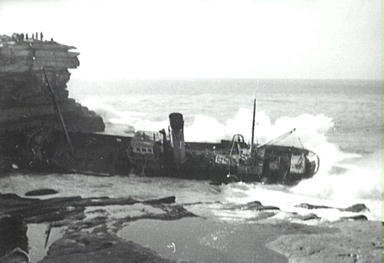 He was assisted onto the rocks by two crew and Jack Punton of Leichhardt carried Mr Munro on his back 100 yards along the rocks. When the vessel hit the rocks, Albert Tahtinen cut his head on the hull while having a shower. He went up on deck to see what had happened. Finding the ship aground, he returned to the bathroom to get his trousers. The ship's dog, "Sluggo", died when washed overboard but the ship's cat was saved. The Goolgwai was racked by heavy seas and waves washed right through the bridge. Two days later the ship was wrecked, holes pounded in the bow and probably right along the hull. 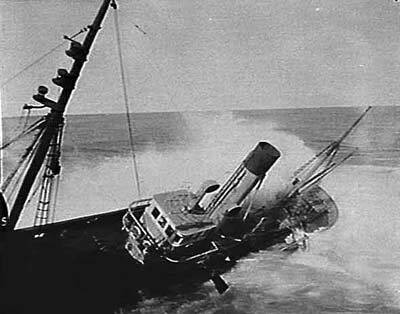 The ship was listing at 45° to port and on 6 June 1955, the ship broke into a number of pieces and was washed off the rock platform into the water. It appears to have then been washed across the small inlet between Long Bay and Boora Point and again got stuck on the rocks on the western side, just outside Long Bay. I think that the second photo above was taken at this time. This photograph is definitely taken on the western side, I have checked the location and even though the rock platform is now not exactly like that in the photo, the background headland lines up exactly. 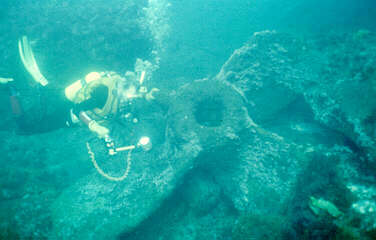 This is north-west of the main wreckage of the MV Malabar. The ship was valued at £10,000 and the cargo of fish at £1,500. I've lived at the suburb of Chifley since 1948 and can remember going down with some of my mates to look at the SS Goolgwai aground on the rocks at Malabar. 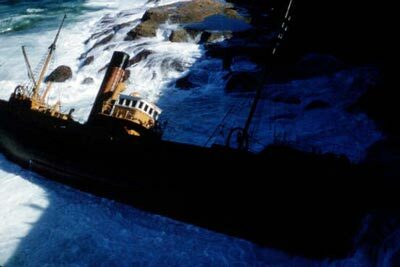 I can recall where this boat was grounded because while we were there, Movietone News actually filmed us pointing and looking at the wreck and it was shown on the matinee news at the Vocalist Theatre (Maroubra Junction) the following Saturday. Our 15 minutes of fame! I've now been down to this spot and taken a GPS reading of where I am sure the SS Goolgwai was wrecked. There is wreckage around the rocks here probably from the SS Goolgwai. The reading is -- Lat. 33º 58'11"S Long. 151º 15'28"E.
Dennis has sent me a map of Long Bay showing where the Goolgwai is located from his memory. This is located above at left. On 26 January 2001 he also showed me where the location is. This location is about half way along the north-eastern shore of Long Bay, about 150 metres out from the small boat ramp. However, as I pointed out above and can be seen from the photographs, the wrecking certainly occurred on the outer point of Boora Point and the wreck was later washed west. It may then have been further washed around the point to where Dennis saw the wreck. There is wreckage in the location Dennis has identified, although none of it is discenable as being from the Goolgwai. It is possible that some parts have become mixed up with the Malabar's wreckage and some may have moved off the rock reef onto the sand. There is a prop located next to the engine of the Malabar but it is certainly not the prop off that ship (the bronze prop was salvaged). I had thought that perhaps this was the Goolgwai's prop rather than cargo but this would be unlikely unless Dennis is incorrect about the location of the wrecking as the weight and distance to his wreck site is too far. 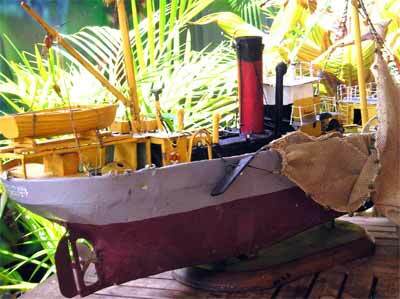 Also, the prop near the Malabar's engine is almost exactly where the prop is in the first photo above of the wreck. No trace of the engine or boiler has been found on the site. It may be that the boiler rolled across the sandy bay under heavy seas but where is the engine? A triple expansion steam engine is very large. Who knows? Is this the prop of the Goolgwai?